Statistics point out that today even young kids often become "hackers" after reading a few docs published on the Internet. If you don't want to be responsible for your kids buying goods on-line with stolen credit cards, you need a program like REFOG Keylogger that logs all keyboard activities and applications running. The program can send you reports via e-mail. You will have access to all e-mail written by your kids and all their passwords. You cannot spend all your time watching your kids on the computer. Try to entrust your kids to REFOG Keylogger's care. REFOG Keylogger logs all keystrokes on the computer where it was installed. It also logs all running applications and the captions of their windows. In addition, it keeps track of all visited URLs. REFOG Keylogger stays invisible. It cannot be seen with Windows Task Manager. You need to know a secret key combination in order to make it visible. With REFOG Keylogger, you always know what your kids are doing. 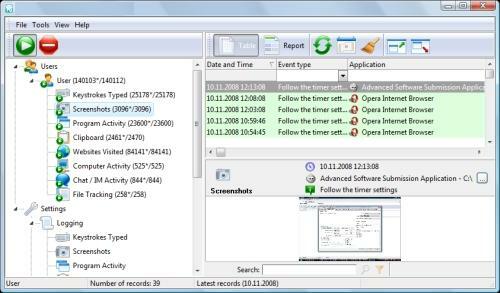 You can easily export logs into Excel and find out how much time they spend on every application for a week, for example. You also can see the content of their e-mails, URLs they visit and all the passwords for all their on-line accounts. You don't even have to access their PC directly. REFOG Keylogger can send you reports via e-mail. Qweas is providing links to REFOG Keylogger 7.2.0.1452 as a courtesy, and makes no representations regarding REFOG Keylogger or any other applications or any information related thereto. Any questions, complaints or claims regarding this application REFOG Keylogger 7.2.0.1452 must be directed to the appropriate software vendor. You may click the publisher link of REFOG Keylogger on the top of this page to get more details about the vendor.